- There is parking for 2 vehicles at the property. Additional parking can be found throughout the community. DETAILS: This charming single story park side cottage features a screened in porch and a private carport for convenient parking. As you enter, you are welcomed by an open floor plan with a comfortable living room with ample seating, a queen sleeper sofa and a wall-mounted 50 inch flat screen TV with blu-ray DVD player. On the opposite side from the living area, you will find the dining area that will seat up to six. Adjacent to the dining area is a galley style kitchen with stainless steel appliances, granite countertops and a seated breakfast bar area that seats two comfortably. Down the hall are the master and second bedrooms. The master suite features a king size bed, a television and a connecting bath, featuring a double vanity and separate garden tub and shower. 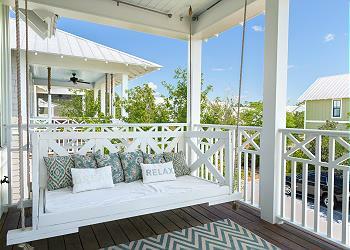 In addition, French doors open onto a furnished screened porch that looks out onto a courtyard. The second bedroom is opposite the master suite and provides a queen size bed, a television with DVD and a connecting bath featuring a single vanity and a tub with a shower. The guest bedroom also features doors that open onto the screened porch. We had a great time. We have stayed in multiple houses on the same street and #27 had everything we needed. We would rent it again. We are so glad you enjoyed your time with us in Watercolor! Thank you for staying with 360 Blue, we hope to see you again soon! While Watercolor and Seaside are beautiful we were very disappointed in the quality and cleanliness of this rental. It appears beautiful at first but sheets and towels were uncomfortable, bathrooms needed to be better kept and the dishwasher and laundry were very loud and inefficient. There were several other minor signs of wear on all appliances and utensils. The bikes provided by the rental and the two additional we ordered through the concierge were rusty. Again, while this beach and the pools/community were great but the condition of the rental left a lot to be desired at this price point. Finally, the tennis and work out facilities havd a very heavy surcharge which I thought should be included or more heavily discounted. We do apologize for your less than stellar stay with us. We would have loved the opportunity to have corrected these issues. We are always available during your stay to help rectify anything that does not meet your or 360 Blues standards. We will be sharing your valuable feedback with our team and we hope you are able to visit the South Walton area again soon!